Read my blog about my year as a Bullard Fellow embedded at the Harvard Forest, exploring the human and natural history of a single 100-year-old red oak for my forthcoming book, Witness Tree. Just as the buds finally start opening on the trees, the buzz is building for the launch for Witness Tree. I’ll be kicking off a spring series of parties and readings on both coasts beginning at the downtown branch of the Seattle Public Library Tuesday April 11 at 7 pm. 1000 4th Ave. Seattle area friends, hope to see you there! Boston and Petersham friends, I’ll be there for readings at the Harvard Forest May 2 at 7 pm and at Arnold Arboretum May 5 at 6 pm. Meanwhile, I went on Q13 Fox this morning to talk about the book. Enjoy this short clip! Very busy planning the launch April 11 in Seattle at our beautiful downtown public library, co-presented by the Elisabeth C. Miller Library of the University of Washington Botanic Gardens and the School of Environmental and Forest Sciences at the College of the Environment at the University of Washington. First national review for Witness Tree, and it’s a beauty! An update on Witness Tree, the book about my year with the big oak at the Harvard Forest. Pre order the book and mark your calendar for launches in Seattle, Petersham, and the Arnold Arboretum! In Boston, at the Arnold Arboretum, May 5. I just returned home to Seattle from a grueling reporting trip to North Dakota for the Seattle Times, where with my colleague photographer Alan Berner we were witnessing the standoff with police from eight states against native people and their supporters opposed to the Dakota Access Pipeline. Time again during our work on the front lines and back in the protest camp, we were struck by the importance of animals. Alan’s photos captured in our Seattle Times special report not only pepper-sprayed demonstrators and arrests — but the special role of animals, with their people. 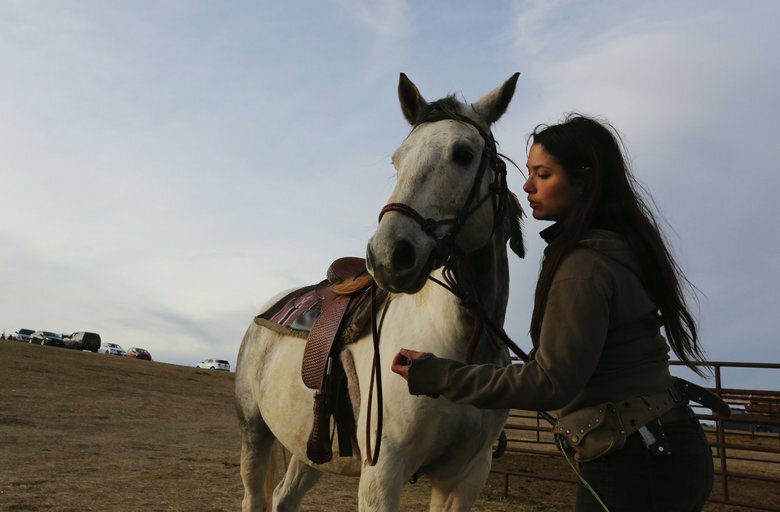 This photo by Alan Berner of the Seattle Times shows the tender connection between people and horses at the Oceti Sakowin camp, home to hundreds of opponents of the Dakota Access Pipeline. This beautiful horse for instance — one of many we saw in camp, and on the front lines. 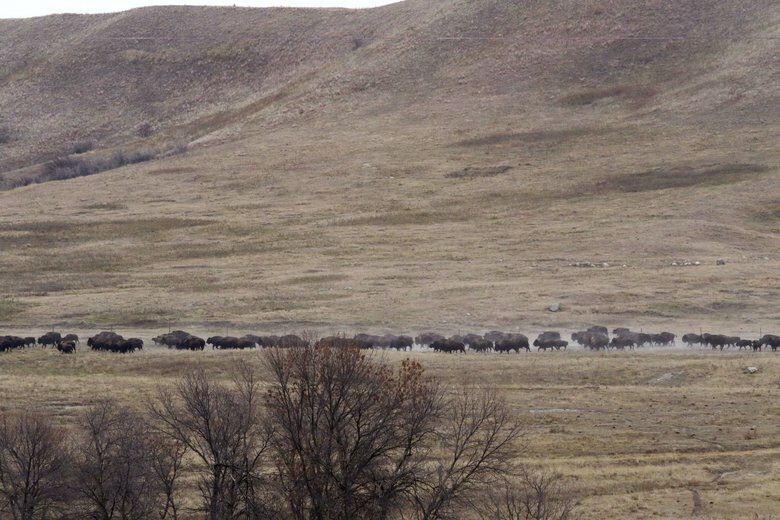 But most spectacular was the herd of buffalo that spontaneously flowed over the prairie as demonstrators were facing one of their hardest days on the front lines, on October 27th, 2016. Demonstrators were outnumbered and outgunned by police from six states in armored personnel carriers, ATVs and using pepper spray, rubber bullets, bean bag shot guns. They were arresting demonstrators by the hundreds. But just then, over the hills came the spirit animal of the Dakota/Lakota people, by the thousands. Tatanka. The buffalo. People screamed. Shouted. Wept. Here they were: their oldest friends, in their hour of need. I was struck all over again at how animals tell us where and how we are in our human lives, and remind us that we are embedded in nature. When I was reporting my book Witness Tree, while at the Harvard Forest in 2014-15, it was the animals that told the story of the change in the New England woods as much as the trees that now cover what used to be farms. A fox saunters down the stone wall by the big oak. 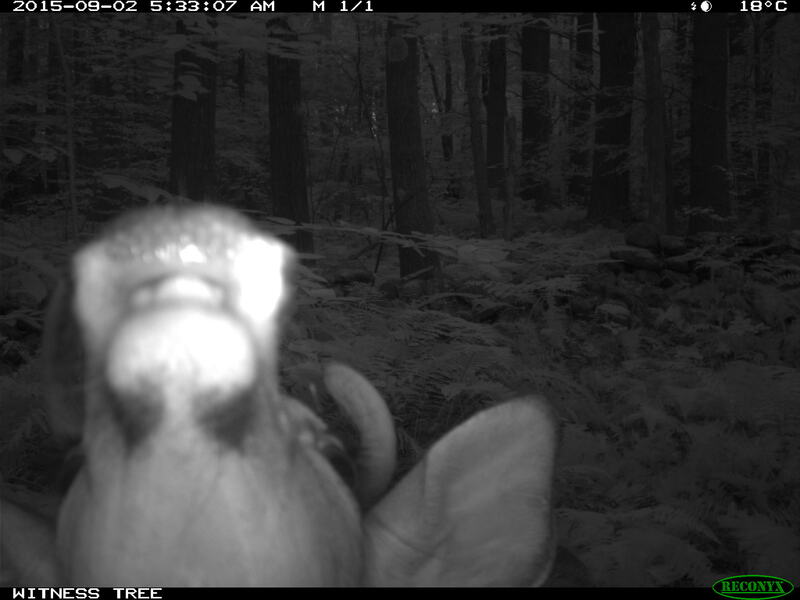 Not sure what is happening in this photo but pretty sure it involves a young buck. Isn’t that an antler by his ear? Returning to the places they were long run out of, whether buffalo of the Great Plains of the native wildlife of New England, animals are our fellow travelers on this earth. They remind us often when it seems we need it most of our place in a wondrous world, far bigger than ourselves. The folks at Bloomsbury Publishing have been hard at work editing, copyediting, and designing my forthcoming book, Witness Tree, due out next spring. 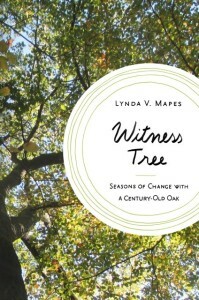 The book is the story of climate change, told through the life of a single, 100-year old red oak tree. I spent 2013-15 researching it first as a Knight Fellow in Science Journalism at MIT and then a Bullard Fellow in Forest Research at the Harvard Forest, where this beautiful tree lives. My day in and day out companion for a year in residence at the forest, its beautiful, wild life is the inspiration and storyline of my book. A living timeline, it tells the story of our changing relationship with nature, and all that has meant for our living world. Living with this tree and learning its story changed my life, and I hope it changes yours. To see deeply into the life of one living thing is to see your own life much more clearly. One of the most fun parts of any book (if it goes well) is the selection of the cover. I think it beautifully captures the glow, the majesty and gorgeous wild life of this single, beautiful oak through which I came to learn, and see so much. Back with more updates on the project soon, including my trip to the Harvard Forest next month to see my tree, and climb it again along with others during the Women’s Tree Climbing Workshop. 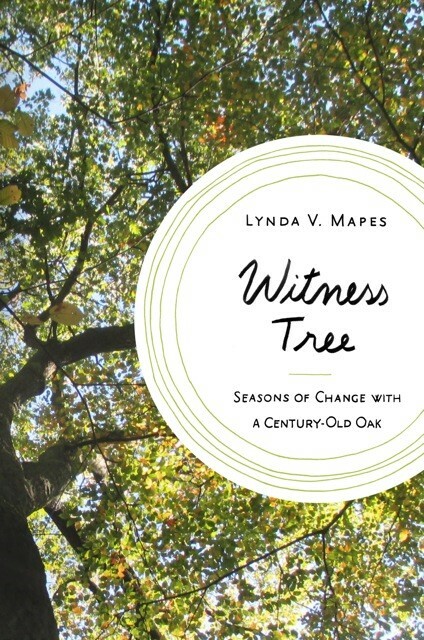 Enjoy the beautiful new homepage for my Witness Tree project on the Harvard Forest website, where all the content about my book in the making is conveniently organized in one, lovely spot. The new video trailer about my book project is there, as well as a link to this Witness Tree blog, and the live web cam that’s up and running under the tree. Have a look and enjoy! With many thanks to Clarisse Hart, outreach and development manager at the forest for putting it together, as well as this terrific highlight on the video. Have a look at this wonderful video about my book in the works, Witness Tree. Big thanks to my friends at the Knight Fellowship in Science Journalism at MIT for their work creating this amazing trailer about my project exploring the human and natural history of a 100-year old red oak here at the Harvard Forest for my book, forthcoming from Bloomsbury Publishing. The crew from the Knight Program made lots of trips out to the forest beginning last fall to make this film, recording in all kinds of weather and even climbing the big oak with me with help from champion tree climbers Bear and Melissa LeVangie of Trees New England. Getting ready to climb the big oak last March with Melissa, green fleece, and Bear, red fleece. That’s Patrick chugging the last of his coffee, and Rachael. Several fellows in the Knight program this year recorded footage, including Rachael Buchanan a medical producer at the BBC, who also worked up a beautiful animation segment. Patrick Wellever, former director of multi-media training for the program, now headed to a great new job at National Geographic, was the film’s mastermind and producer. I’m doubly grateful to the Knight program because I got the idea for this book while a Knight Fellow in 2013-14 and a guest in the Richardson Lab at Harvard University. That work paid off with a book contract, and a Bullard Fellowship in Forest Research at the Harvard Forest this year, where I have been since last fall, at work on the book. The trailer captures the project and magic of the big oak perfectly. I love the combination of experiences in the film, from the climb, to the animation, and some great time lapse of the tree going through its seasonal year, captured from the web cam that the Knight program also provided for my project. 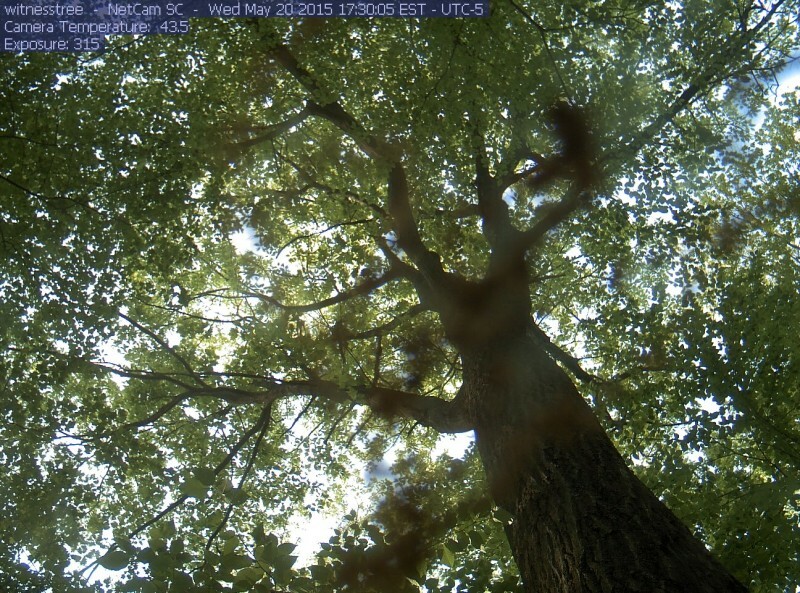 The web cam photographs the tree as it winds through its seasonal gyre. 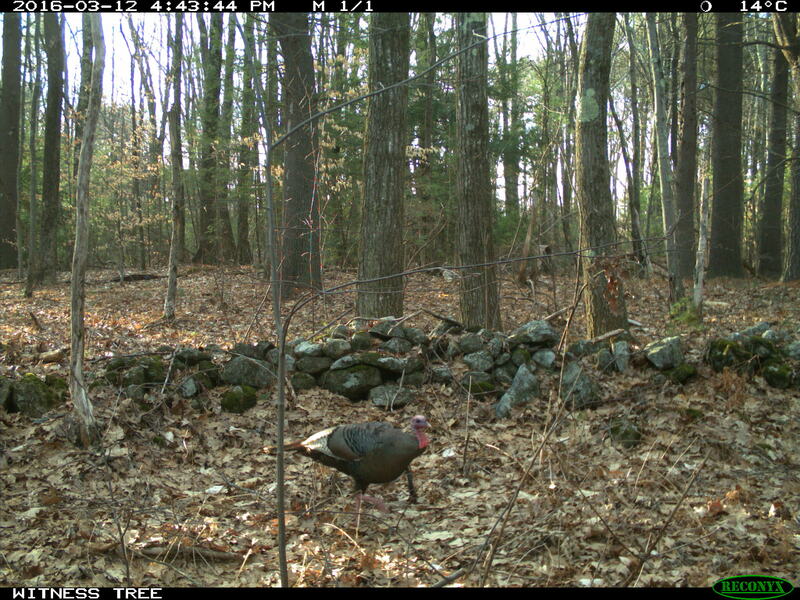 Fresh images of the tree are uploaded to the Harvard Forest web cam page every 30 minutes during daylight hours, year round. The tree looks particularly beautiful today in its fresh new leaves, emerged only a week or so ago. That bit of wiggle in the image is maybe a slug trail, I think, on the cover over the lens. I’ll head over to the tree after I type this to have a look, and wipe it off. Easier than brushing snow off the cover all winter! But I don’t know…slug trails and black flies versus snow…I’ll have to think about that one…but I know this for sure. It’s always good to be out with the tree. Well after all that drama this year’s spring turned out to be, what would you guess….early? Late? Or just about …normal. The red oak I am studying at the Harvard Forest for my book Witness Tree is about half into its leaves. 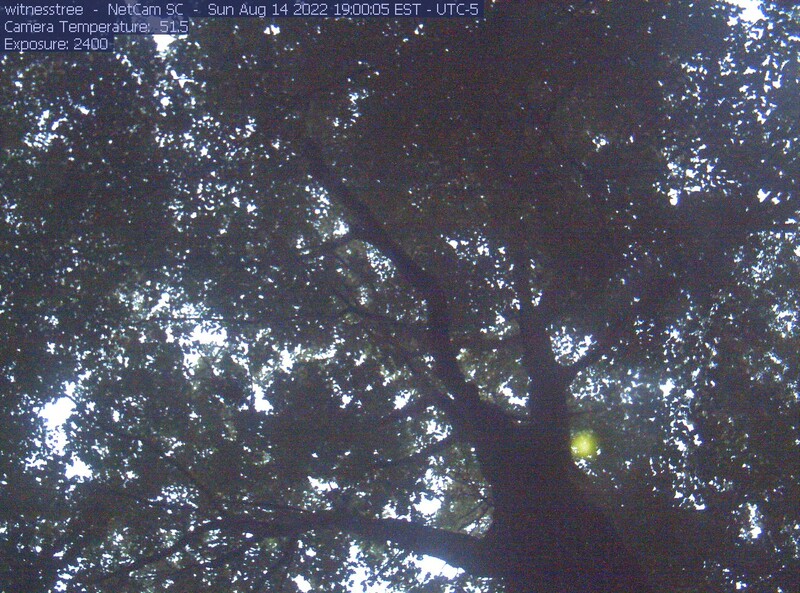 This image is from the web cam that uploads images of the tree every half hour to the Harvard Forest home page. Exactly. 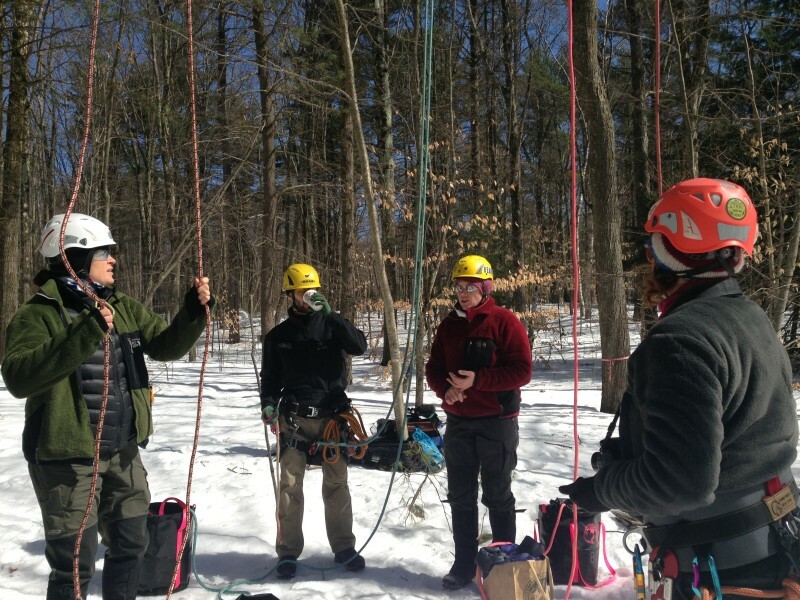 Boston saw record cold, and the Woods Crew here at the Forest – my authority on winter — can’t remember a snowier, tougher season. We all thought spring would take its sweet time. But the big surprise is that spring at the Harvard Forest is right dead on mean average normal for the past 25 years. Not only that, but after a cool April without much happening, in May it suddenly turned and then stayed hot, with temperatures in the 70s and upper 80s, creating an unusually compressed season. A fast-forward spring. We have shot into tank top weather so fast it seems impossible that there were more than two feet of snow on the ground a month ago. Now here we are with the trees already at least half in their leaves – and some are further along than that. A lovely sessile-leaved bellwort hosts a pair of soldier beetles. Now is the time of the spring ephemeral wildflowers, with more species coming into bloom by the day. “It wasn’t early. It wasn’t late. 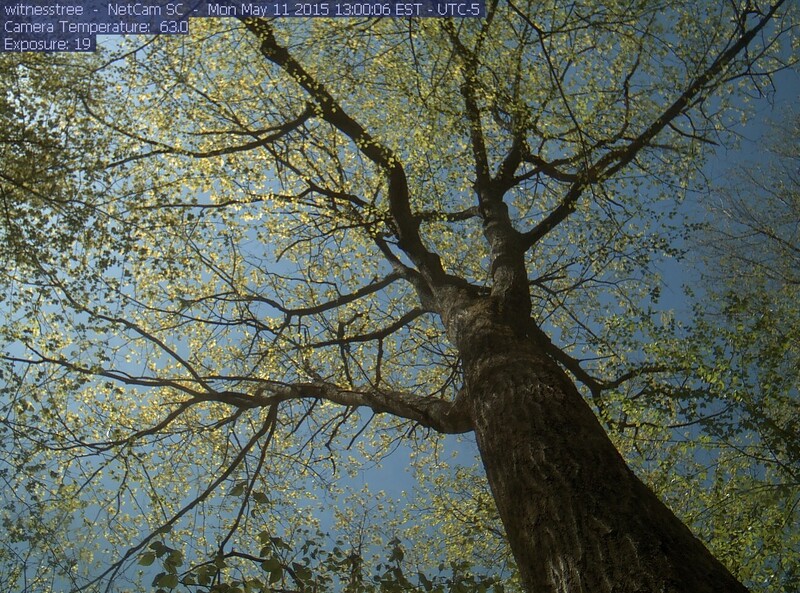 But it was very compressed, that’s the takeaway,” said John O’Keefe, field phenologist at the Harvard Forest just back from surveying his trees this afternoon, tracking bud emergence and leaf growth. Usually, it takes about three weeks or longer for all the species he tracks to leaf out. But this year just about all of the 42 trees John tracks in the spring for leaf emergence, from red oaks to beeches, birches, black cherry, red maple, paper birch, trembling aspen and striped maple broke bud within a week’s time. 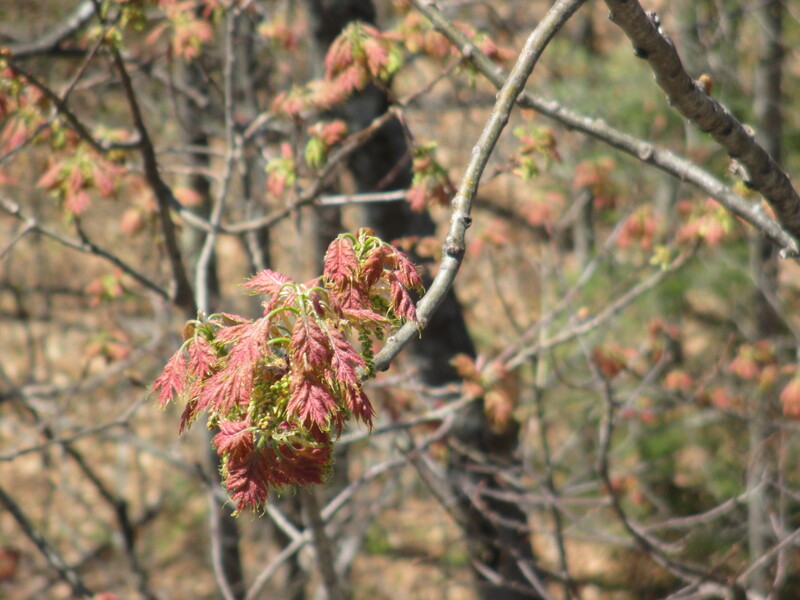 Natal leaves emerge on the red oaks, pink and furry. The color and fuzz protect the young leaves from sun scald and drying winds. John records bud break when the entire leaf is first visible, to the base of the stem. By his survey today, every tree he checks was in more than 50 percent bud break. The only laggards were one white oak, a white ash, and a red maple – only because it has so many flowers. By the next day the ash was in leaf, too. It’s not just the trees that are booming into spring. The animals and birds are back, too. I saw a lovely garter snake today. On Saturday, visiting students from the Harvard Extension School discovered a yellow spotted and red backed salamander under a log. You can see a video made by Louise Johnson from her visit here. The warblers are out in force, and I’ve seen my first scarlet tanagers, one of the most shockingly red birds in the woods. The wood frogs are long finished calling and the ponds I check are replete with egg masses. The peepers are still going strong, even using a little pond in the cow pasture behind my house. 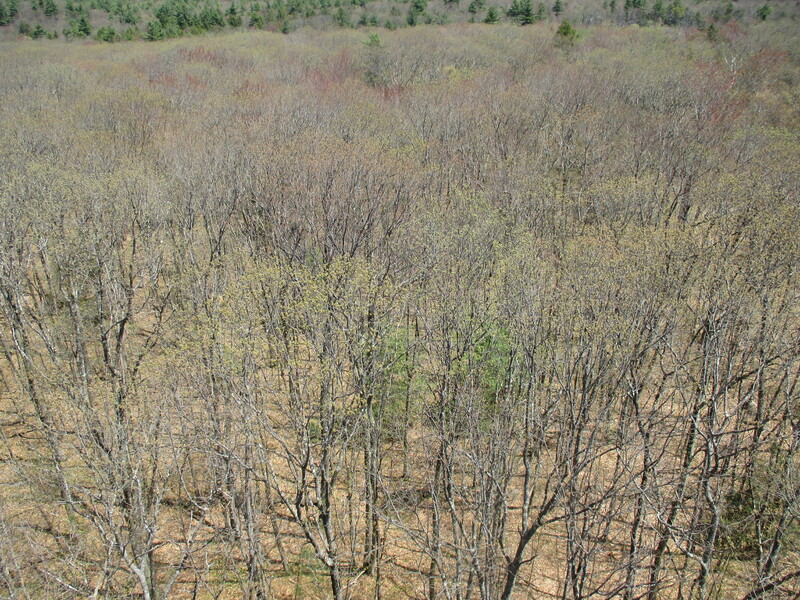 Viewed from the walk-up tower above the tree canopy at the Harvard Forest the red oaks are a soft sea of bloom and new leaf. As I write this, the fragrance of Korean spice viburnum, two floors down outside the back door of Shaler Hall, is drifting in the window to my office which is deliciously wide open to the spring breeze. Speaking of flowers. Now is the time of the spring ephemerals. Flowers and forest herbs began emerging and blooming a week ago and it won’t be long before the tree canopy closes and the show is over. Ferns are already nearly knee high. Spring ephemeral wildflowers and herbs take advantage of the sunlight pouring through the tree canopy before the leaves are fully out. The forest floor is receiving its maximum light and sun right now – and more species are in flower by the day. John began tracking the seasonal timing of the forest canopy and woodland shrubs in 1990. His records have become particularly valuable because he has compiled such a long record by a single observer. 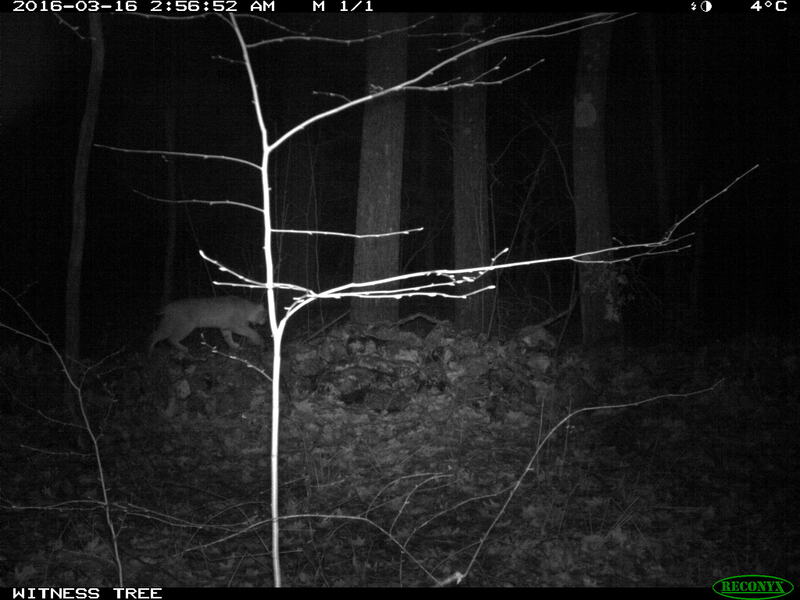 This was his 26th spring walking his 2.5 mile survey in the woods. 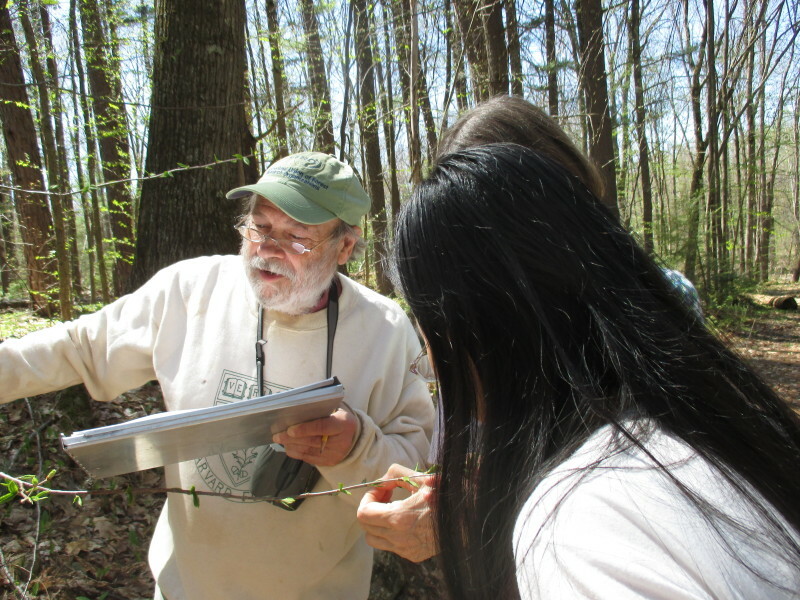 John O’Keefe explains his data collection method to visitors at the Harvard Forest. 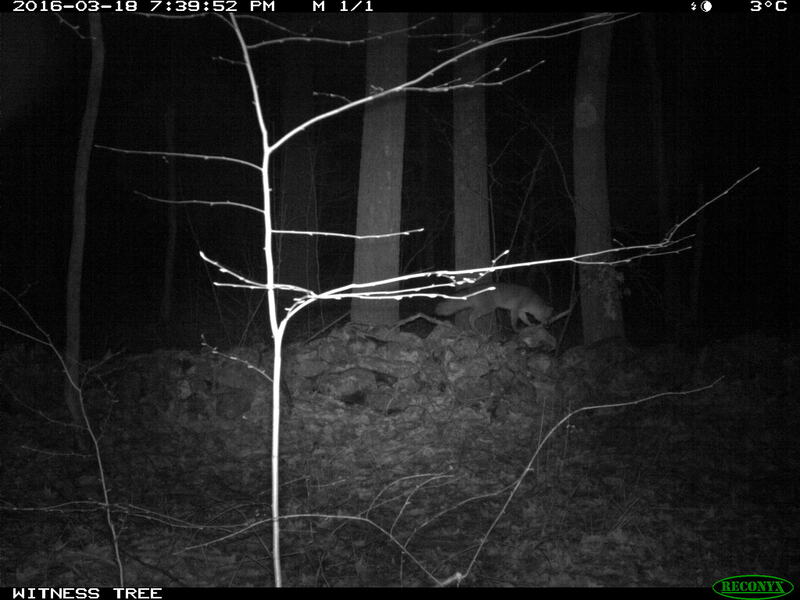 He is tracking his 26th spring at the forest this year. Phenology – observance of biological events in nature that are influenced by climate – is an ancient practice, with new scientific relevance because it shows the influence of global change on living things. Here at the Harvard Forest, John’s data shows spring on average is arriving earlier, fall later, and winter is squeezed on both ends. The growing season over 25 years John has been observing these woods has extended by about four and a half days, with most of the extension coming with later onset of fall. In a Googled world, The Harvard Forest is the land of the long view, the deep dive, a place where researchers look up close at the landscape and its history, to see what the trees can teach. So it is that Audrey Barker Plotkin and I recently went out to take a look at what she had learned at Walter Lyford’s plot. Audrey Barker Plotkin locates the red maple, left, and red oak, right, depicted on Lyford’s hand-drawn map. 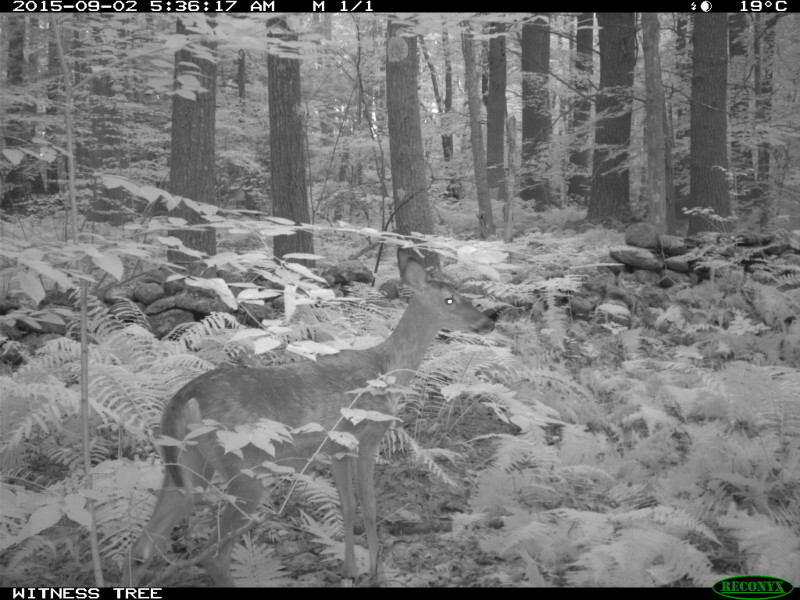 Unique, long term data sets are a hallmark of the Harvard Forest’s scholarship. Lyford was a meticulous soil scientist at the Harvard Forest, a 3,700 acre research forest in Petersham, MA and a department of Harvard University. He established a permanent 7 acre plot at the Harvard Forest in 1969, where he measured and located every tree over two inches in diameter on a hand-drawn map — 6,000 trees in all. This beautiful, large-scale map is preserved at the Harvard Forest Archives today. It includes every feature on the forest floor in the plot: live and dead trees, stonewalls, boulders, and more. 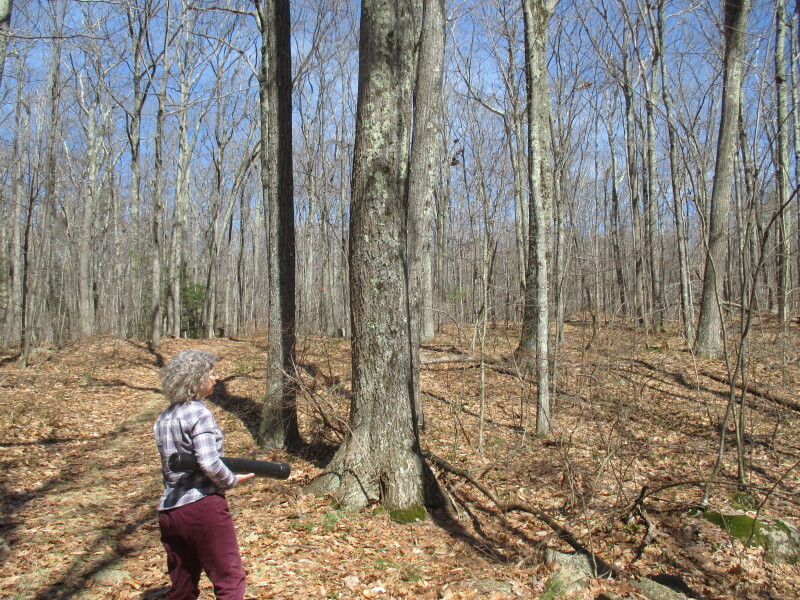 Barker Plotkin, research manager at the Harvard Forest and her collaborators have been considering the 42 years of monitoring data accrued by now in five surveys of the plot, including the most recent, in 2011. What they found was new relevance in old data, because of the point of comparison Lyford’s baseline provides in a changing world. Since the plot was first laid out in 1969 much has happened – including the acceleration of climate change, and atmospheric levels of carbon dioxide causing it. It’s a change you can see in the trees. 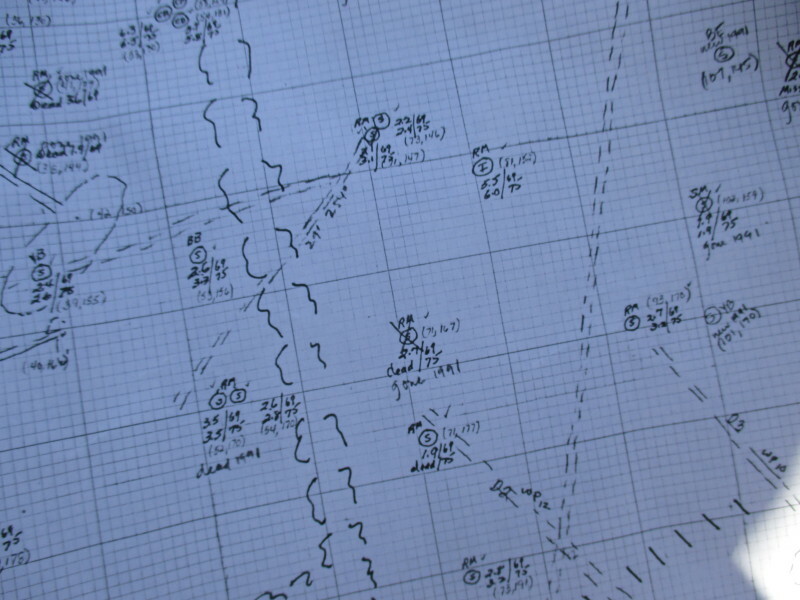 In a Google world Walter Lyford’s hand-drawn map meticulously noting the features of his study plot is a treasure of detailed, place-specific information. 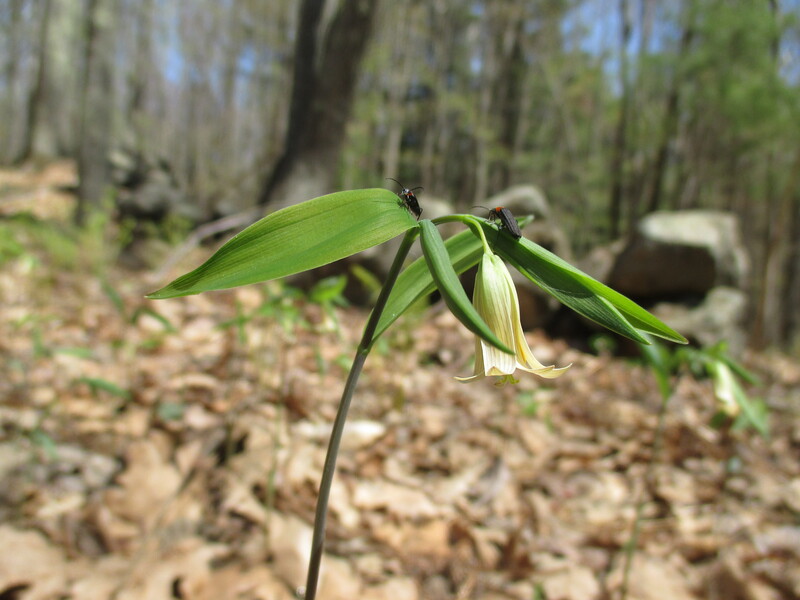 Barker Plotkin and Kate Eisen of Cornell University – who did her work as part of the undergraduate research program in ecology at the Harvard Forest — published their results in the Journal of the Torrey Botanical Society today. The paper documents their analysis of a 2011 resurvey of the 6,000 trees in the Lyford plot, showing the trees in this mostly 110-year old stand are still growing – especially red oak. From 1969 to 2011, red oak increased its dominance in this grove to clock nearly 70 percent of the total tree biomass. Meanwhile red maple receded to a lesser presence, as red oak asserted itself over the maple canopy. 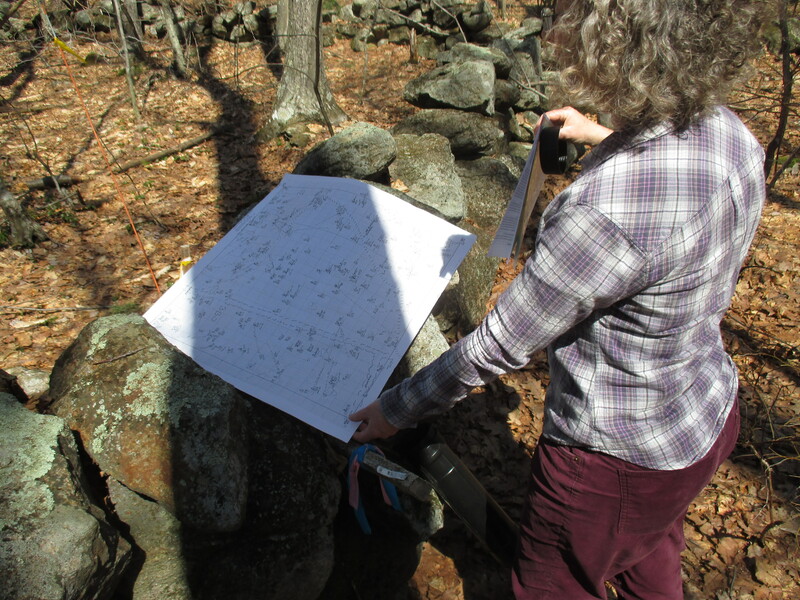 Barker Plotkin checks Lyford’s map to locate two individual trees, using the handy desk of a stone wall — also on the map, of course. On our walk, Barker Plotkin and I used a Xeroxed portion of Lyford’s map to find a classic example of this dynamic. She unrolled the map on a boulder (also on the map) and crooked her head back to point out a pair of trees, one a big red oak, and the other a red maple tucked under its canopy. “If you want to see how great oak is, this is a pretty good place,” she said. Both trees had been measured and mapped in Lyford’s original survey. That enabled Barker Plotkin to see the maple had grown half as much as the oak over the 40-year period. And the oak were still surging ahead. That’s the small, two-tree picture, but the value of it is that these two trees, watched over time, tell a planetary story. The tale of two reds – red maple and red oak – revealed by the long term research plot is that in the absence of some sort of major wipe out storm or other disturbance, red oak will continue to increase in size, and the stand will keep packing away the carbon it pulls out of the atmosphere for at least another century. Red oak is the workhorse of the forest: its biomass more than doubled in the intervening years since Lyford’s initial mapping – compared with a 48 percent increase in all the other species. Part of the surprise in the data was how strongly red oak is still growing, even past its 100th year. It could even keep right on going, barring as storm or other major disturbance, maintaining their dominance and packing away carbon into their 200th year and beyond. These oaks are literally eating into the carbon dioxide emissions people are putting into the atmosphere. Trees use carbon dioxide for their food source, to create sugar using the energy of the sun in the process of photosynthesis. Every atom of carbon a tree takes out of the air and tucks away in the form of wood, leaves or roots is that little bit less carbon in the atmosphere, trapping heat energy that’s changing the seasons, and the climate. But just how is it that red oak dominates its grove? Partly, it’s red oak’s style. In a forest, red oak grows in a straight shot to the canopy then spreads a large crown with big strong branches. Red maple takes a more bulbous, contained form. The red oak simply overshadows it – literally. Researchers in the Richardson Lab at Harvard University have also found red oak is honing its performance in response to higher carbon dioxide levels and longer growing seasons caused by global warming. Red oak is increasing both its water use efficiency, and growth. 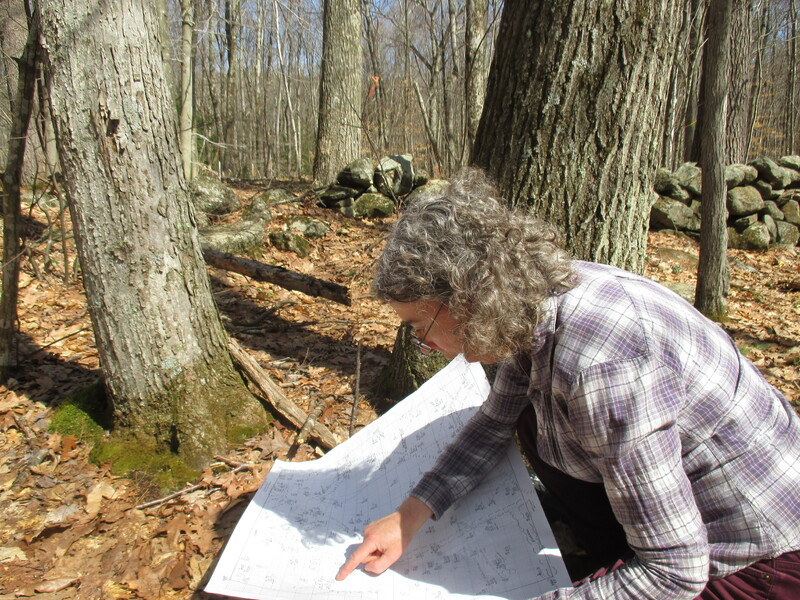 Audrey Barker Plotkin heads out to the Lyford plot at the Harvard Forest, with a photocopied section of Lyford’s map. I am studying a big oak at the Harvard Forest that’s a textbook example of the red oaks in the Lyford plot. While not in the same part of the forest, its life story is the same: it sprouted in what was a pasture cleared by Europeans from the original forest. The pasture was abandoned in about 1840, and then grew in to white pine, cut intensively in the late 1890s. The oak I study today is part of the mixed-hardwood forest that came in after the pine was slicked off around 1900. It’s the third growth forest that comprises most of the Harvard Forest today – and red oak is its dominant tree. Red oak’s witness and role as the industrial economy roared to life, and people left these pastures and farmlands to grow back to woods is the story I tell in my forthcoming book, Witness Tree. It’s a story about not just one red oak, but our relationship with nature, and the role of trees in our changing world.